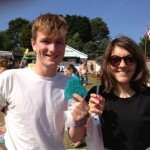 A team from Bournemouth University have just returned from Bestival 2013 on the Isle of Wight. We joined colleagues from other universities including Southampton Solent, Southampton, Portsmouth, Keele & the National Oceanography Centre Southampton in the Tomorrow’s World Arena Science Tent. Rebecca Edwards from the Research and Knowledge Exchange Office facilitated this opportunity by working with colleagues across the region to secure a spot in the famous Bestival science tent! 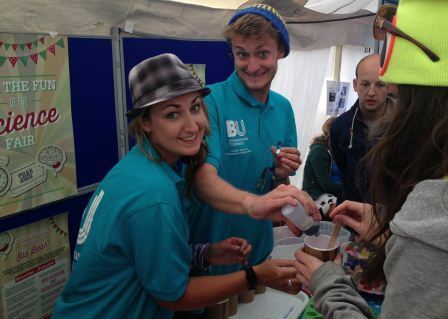 The BU stand was led by the AspireBU programme Science Outreach team. We took a variety of activities to the weekend-long festival, all themed around a traditional British fete. 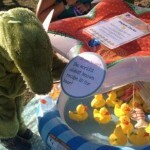 Our hook-a-duck activity was especially popular; astounding festival goers with some quite interesting facts about alcohol & asking them to think about how many calories they were drinking (from both alcoholic and non-alcoholic drinks). We also challenged people to test their reaction times with our Splat the Rat apparatus and the Stroop test. Our team was joined by Dr Sharon Doherty from the AECC, testing people’s perceptions of vertical for the first two days of the Festival. Our most popular activity – perhaps not surprisingly – was making soap! 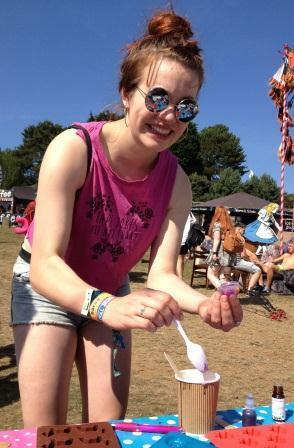 On the first day alone we made soap with over 500 festival goers. Participants learned about the composition of soap molecules and how soap cleans away festival grime. Our large selection of colours, fragrances, shapes (including camper-vans, tractors, ships, Pac-Man, Space Invaders, caterpillars, pigs, ducks & the ever popular dinosaurs) and glitter proved a huge hit with children, teenagers, students, adults & grandparents! 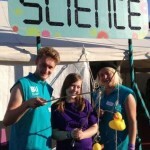 It’s estimated that over the four day festival the Science Tent had over 11,000 visitors! Special thanks to Southampton Solent University & Southampton University for inviting us to participate in the Bestival Science Tent. The Bournemouth team was made up of BU Student Ambassadors Larissa Turney, Craig Carpenter & Emma Craig, Naomi Kay from R&KEO, Ben Thornes from ApSci, Naomi Capell from aspireBU programme and Dr Sharon Doherty from AECC. Please note we do not have permission to use these photos for general publication. Dr Rebecca Edwards in the Research and Knowledge Exchange office for further opportunities.